Rangers boss Alex McLeish has accused the Scottish Premier League of returning football to the dark ages. McLeish is annoyed with the decision to scrap the winter break - and he also wants more teams in the top flight. Celtic manager Martin O'Neill and Dundee boss Jim Duffy have already criticised the SPL's decision to axe the winter break. O'Neill believes that his side would have been less likely to progress to the semi-finals of the Uefa Cup this season had it not been for the benefit of a shutdown and McLeish agrees. "That was a breakthrough, but now we are going back to the dark ages again," he said. "We had something good there. "Sven-Goran Eriksson, Sir Alex Ferguson and Arsene Wenger are pushing for it down it England. "Why don't we study how the Germans have done it all these years? "They have lots of internationals and fixture congestion during the season, but I still think it is good to have a break. "I'm not sure every manager is for it. But a lot are - along with the doctors and physiotherapists. "We definitely needed the break this year." Meanwhile, McLeish believes that a 12-team SPL, with teams playing each other three or four times a season, reduces interest in the game. Rangers' Scottish Cup replay with Dunfermline Athletic means that the two sides will face each other seven times this term. "I suppose everybody knows each other because we play the same teams so often," he said. "It is very stale." The SPL will soon split into two, with the bottom six fighting against possible relegation and the top half chasing the title and Uefa Cup places. 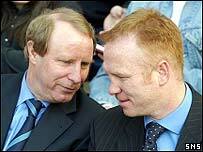 "I'm no great lover of the split, although they are talking about doing it again," said McLeish. "You could have more teams, split the league and still have a change of format." There has been much controversy this season because only two clubs in the First Division have stadiums that would allow them promotion. But McLeish added: "If you had 16 teams then we could still split the league into two at some stage." "But let the bottom clubs play against four from the other division - with the other eight teams left to play for the championship and European places."